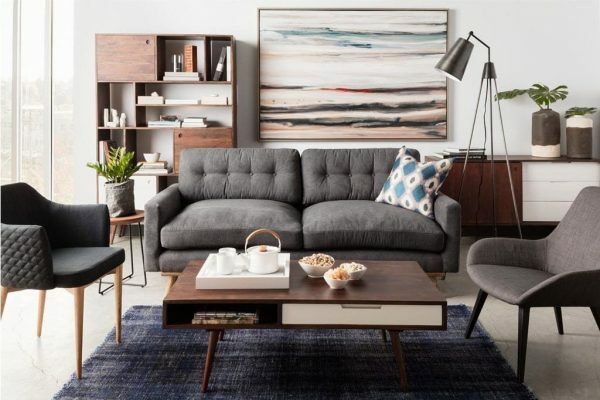 Ever since author Cara Greenberg penned her 1984 book, ‘Mid Century Modern: Furniture of the 1950s’, furniture styles from in and around that period have risen in demand. 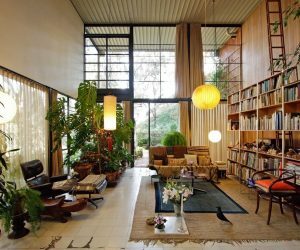 The title of that book was the coining of the phrase “mid century modern”, which has become a term that rolls off the tongues of interior designers and home design enthusiasts still today. 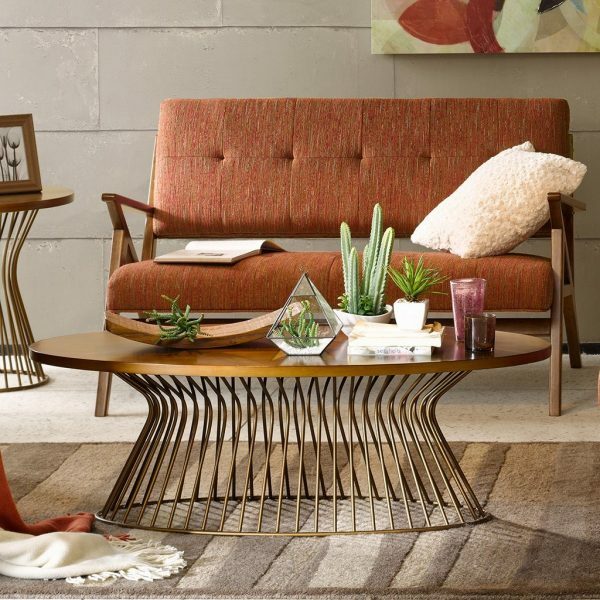 Nowadays the term has morphed to cover anything that is inspired by fashions from all the way back to the early 1930s and stretches up to the mid 1960s, just like this collection of 36 mid century modern coffee table designs of all shapes and sizes. Noguchi Style Table: A classic organic triangle shape that is strongly associated with the mid century modern aesthetic. This table was designed by sculptor Isamu Noguchi who created his first furniture prototypes for Herman Miller in 1942, before this one in 1948. 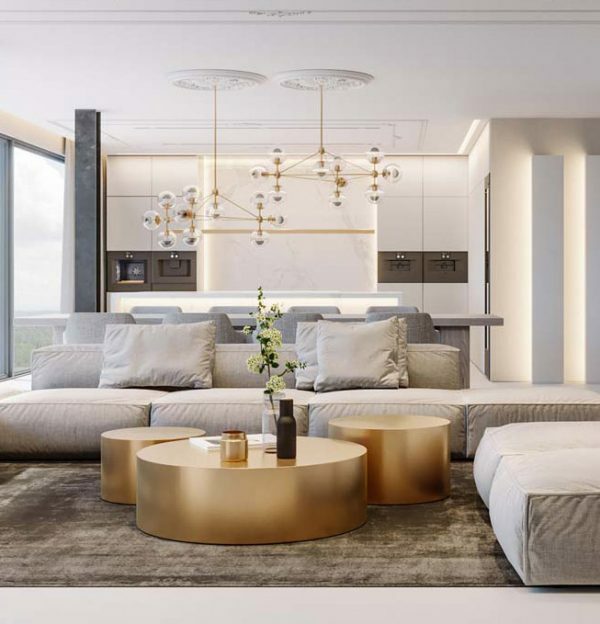 The creation consists of a thick glass top upon two interlocking curved solid wood legs that can be selected in black, cherry, walnut, white ash or solid white. This is an attractive reproduction that offers both form and function. If you would like to get your hands on something more authentic, the original is available here. 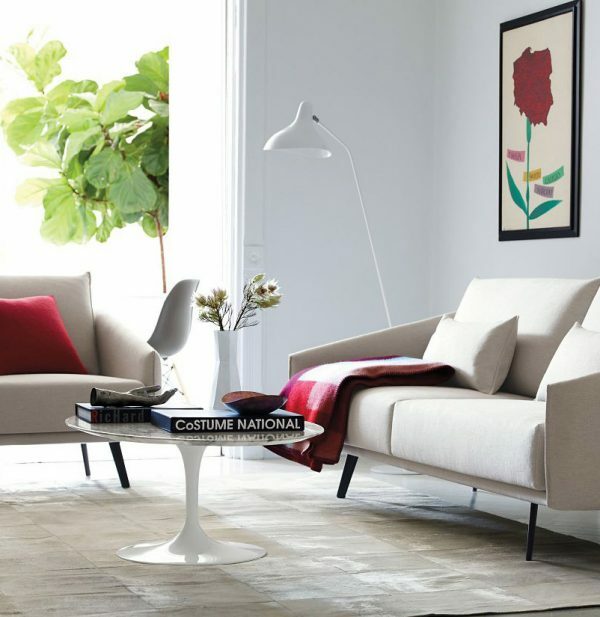 Noguchi Rudder Table: Imagined by Isamu Noguchi for Herman Miller in 1949, this authentic designer mid century coffee table features an asymmetrical form that matches with the renowned Noguchi Table. 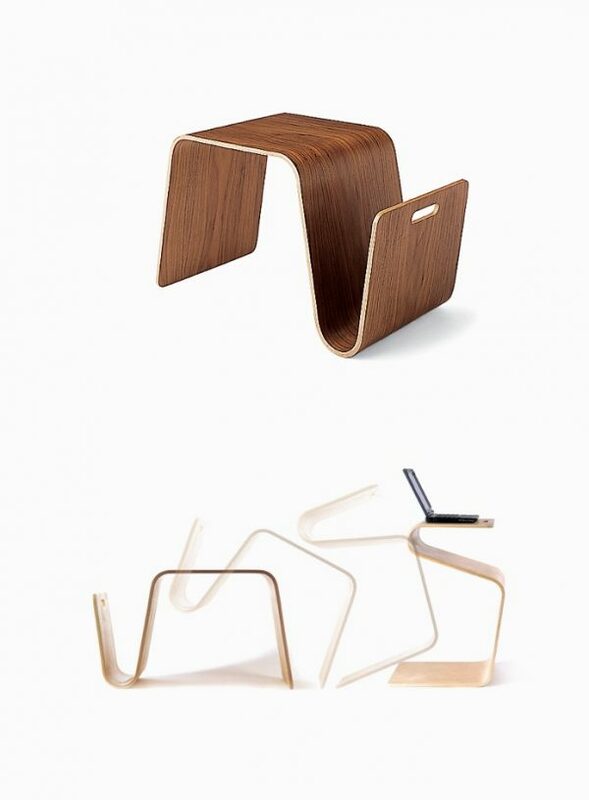 It is available in ebonized maple, walnut or white ash veneer over plywood, all coupled with chromed steel. The two hairpin legs appear barely there, giving the third solid leg the look of being a rudder, and thus giving the table its name. 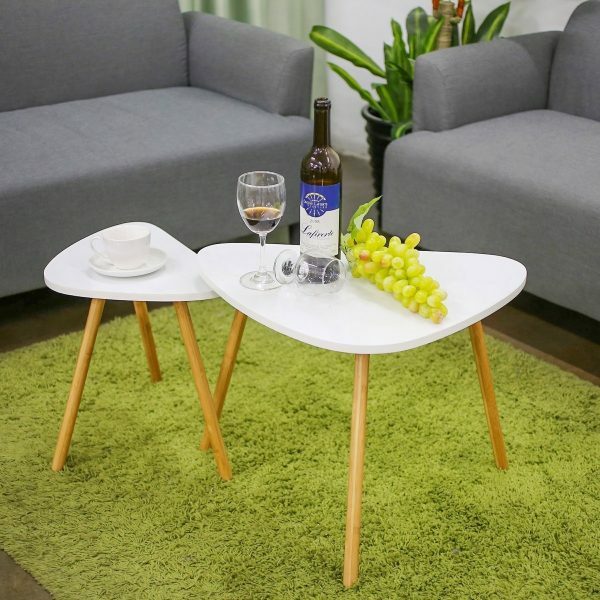 Eames Style Molded Plywood Coffee Table: With over 70 years having passed since Charles and Ray Eames began experimenting with molded wood using their “Kazam! Machine”, the Molded Plywood Coffee Table stands as testament to their signature technology. This reproduction is based on the indented surface design from 1946. The original design by Charles and Ray Eames for Herman Miller is available here. 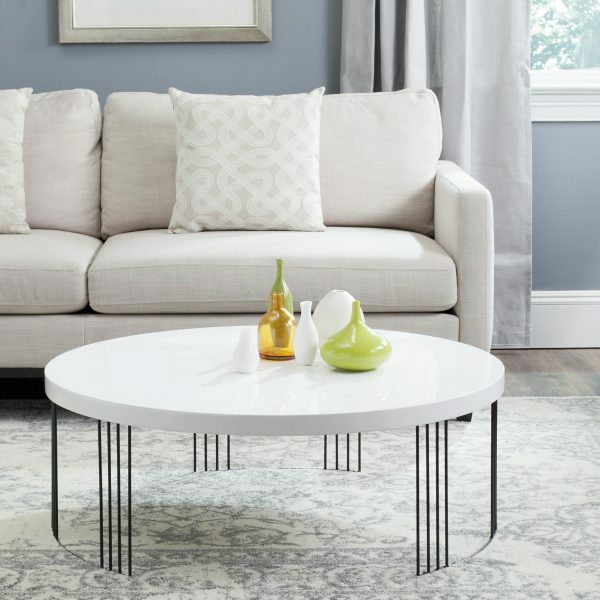 Saarinen Style Low Oval Coffee Table: This oval mid century modern coffee table has a chip-resistant fibreglass top and a powder-coated metal base that is organically shaped in timeless form. A ‘Time’ magazine story published in 1956 quoted Eero Saarinen as saying “the underside of typical tables and chairs makes a confusing, unrestful world” and went on to document that he was in the process of designing a new collection to “clear up the slum of legs in the U.S. home.” Later that year he completed his Pedestal Table, inspired by a drop of high-viscosity liquid. The original is available here. 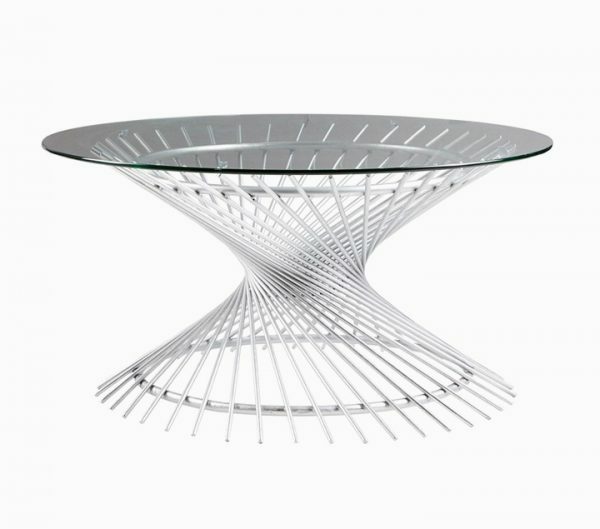 Platner Style Coffee Table: Chrome look steel wire forms the base of this glass top mid century modern coffee table, which is based on the Platner Collection from 1962. 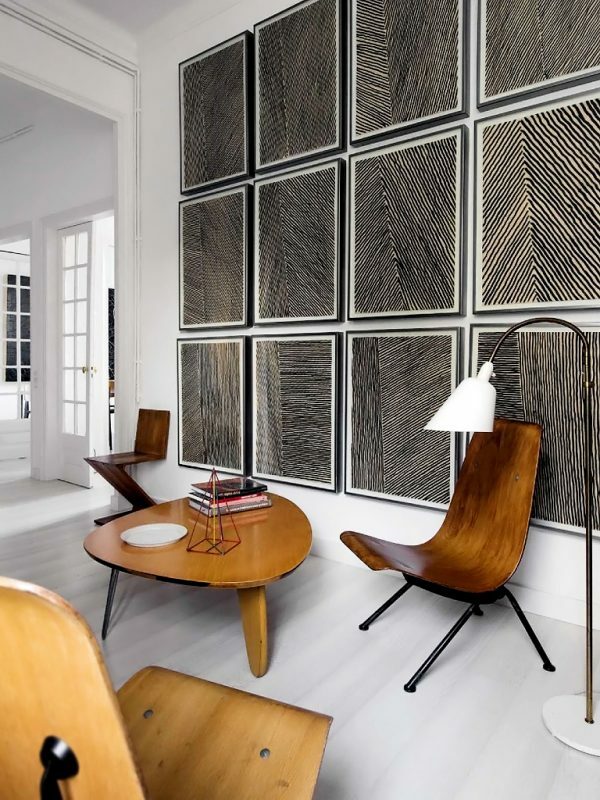 Warren Platner believed there was room in modernism “for the kind of decorative, gentle, graceful design that appeared in a period style like Louis XV” and so devised the structure and production method for this steel wire furniture that requires a huge 1,000 welds. The original is constructed of steel and finished in bright nickel or 18-karat plated gold with a clear lacquer protective coating, and is available here. 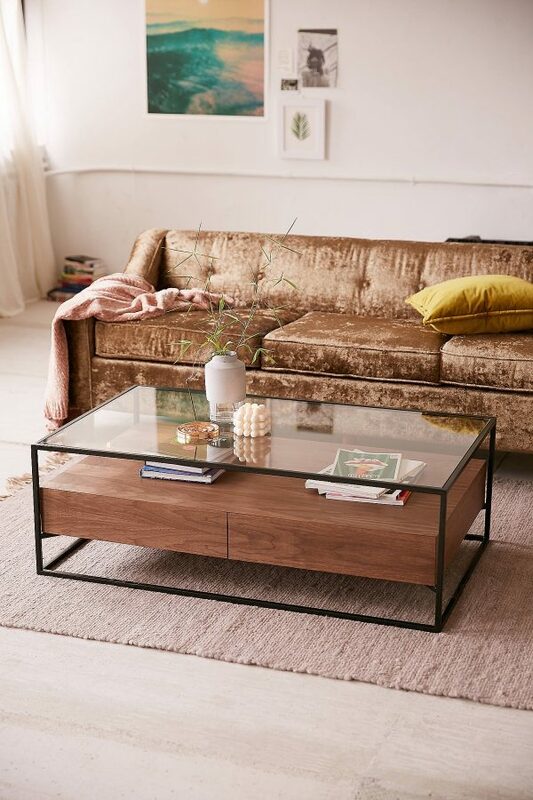 Mid Century Modern Oval Coffee Table With Bronze Top: If you’re in need of a less budget busting mid century coffee table for sale online, then how about this version finished in bronze. Mid Century Style Coffee Table With Spiralling Base: A more modern adaptation of the Platner Style, this glass mid century modern coffee table has a chrome coloured spiralling trunk. 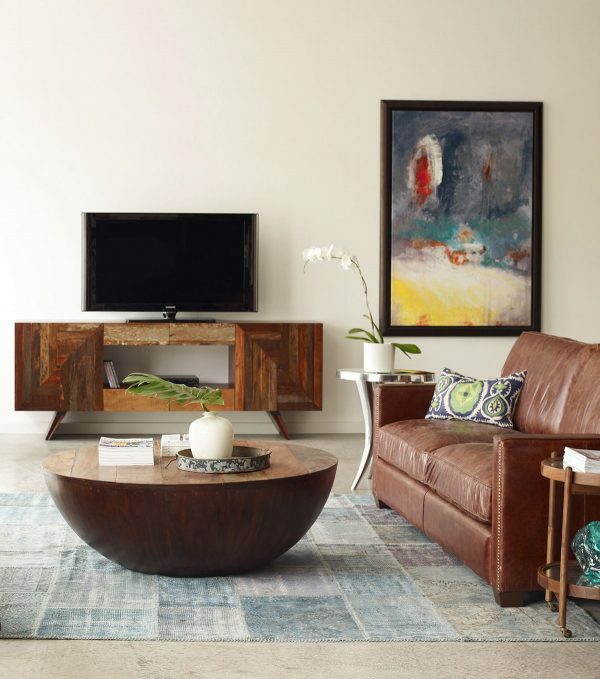 Drum Style Coffee Table: Originally designed in the 1970s by Milo Baughman for Thayer Coggin. The Drum Table is sophisticated yet simplistic, with a sleek cylindrical design that is manufactured by hand so that seams are well blended. Constructed in stainless steel and finished in bronze. The original can be sourced from here. Semisfera Coffee Table: A wooden mid century modern coffee table has a warm nostalgic appearance, and this half spherical shaped example in reclaimed peroba wood has a smooth tactile look to boot. The table is intended for indoor use but is sealed with a clear lacquer to protect it against moisture from occasional spills and light cleaning. Eames Style Elliptical Coffee Table: Another based on a design by Charles and Ray Eames for Herman Miller, this was nicknamed the “surfboard table” for obvious reasons. Originating in 1951, the elongated elliptical table was re-issued by Herman Miller in 1994 and can be purchased here. 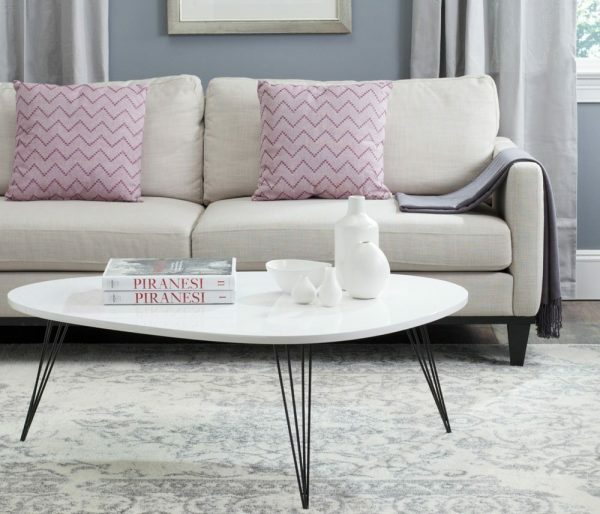 Wegner Style Coffee Table: A solid American cherry wood top sits on three angled legs to provide structured support and an understated aesthetic. 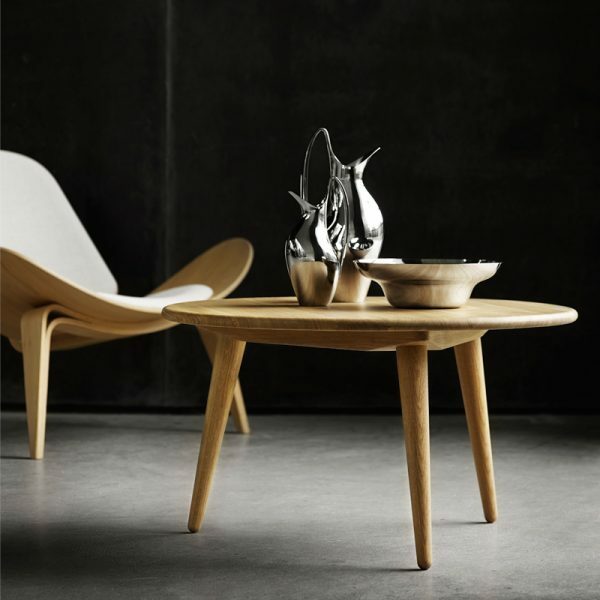 The original compact design from 1954 by Danish modernism pioneer Hans Wegner is available here. Mag Table: The flexible design of this transitioning table means that it would make a great piece of furniture for small spaces. This singular item is low enough to be used as a seat as well as a coffee table, and when flipped on its end it places a surface at an ideal height to be used as a laptop stand. Even though this was designed in the late nineties, it fits well with the mid century aesthetic. 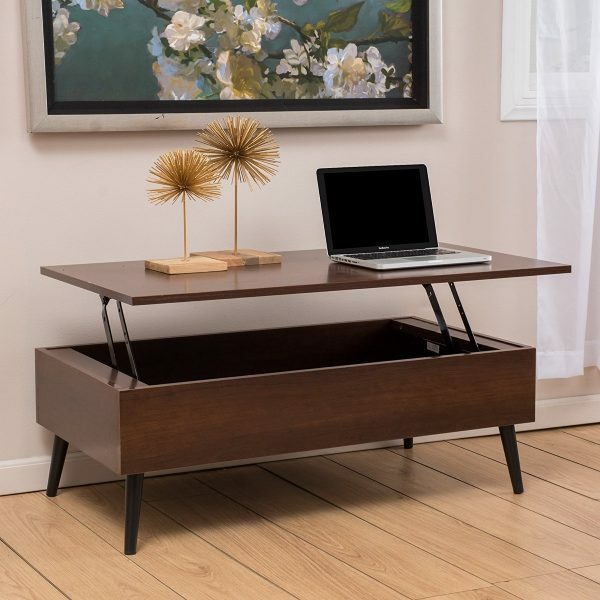 Scando Table: Matching the same undulating profile as the previous table, this mid century modern sofa table is a much bigger design, large enough to fit two stacks of magazines side by side in its built-in rack. 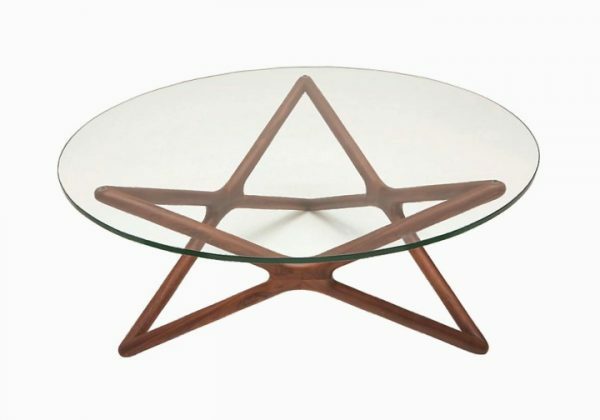 Mid Century Modern Coffee Table With Star Shaped Base: An American walnut base has been crafted into a star shaped design that is viewable through a clear ½ inch tempered glass top. 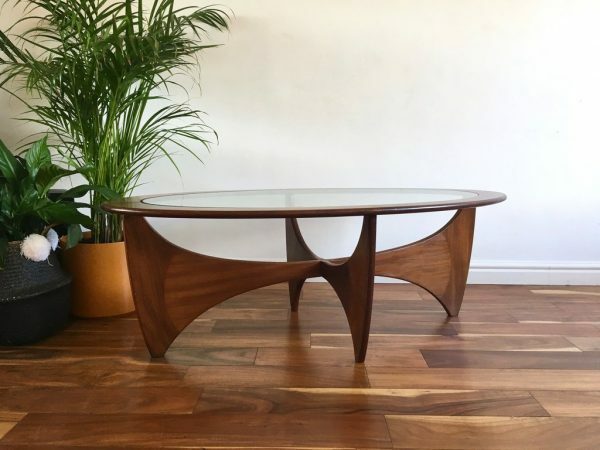 Mid Century Weathered Round Coffee Table: This walnut mid century modern coffee table has a fan of six slimline arched legs. The weathered finish of the wood coupled with crystal clear glass makes this equally suitable for either a rustic or contemporary setting. 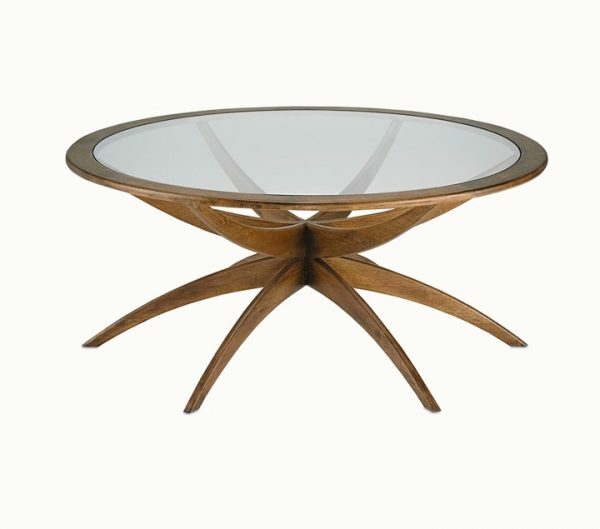 Kardiel Mid-Century Modern Plywood With Glass Top Coffee Table: American solid walnut wood has been uniformly kiln dried to a stabilized moisture level and triple sanded for the smoothest possible surface. The inherent nature of solid and real wood veneers bring changes in wood grain and color that make each piece unique. 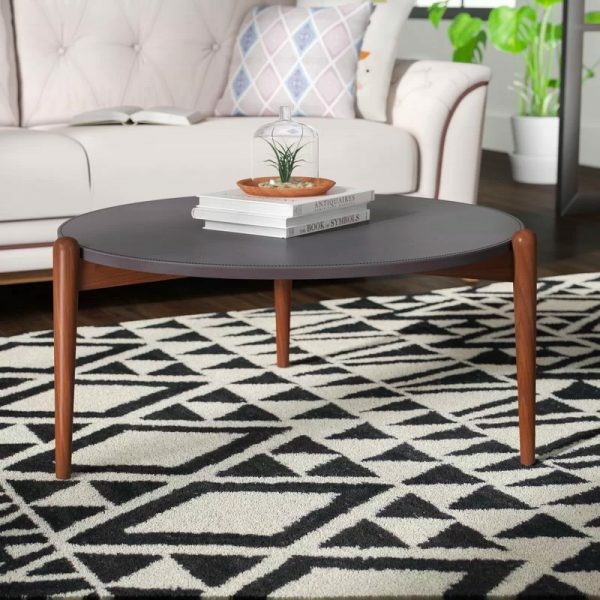 Mid Century Modern Style Black & White Coffee Table: Manufactured in wood and iron, this monochrome coffee table would look great in any setting. Circular Black & White Mid Century Coffee Table: A round mid century modern coffee table makes a perfect centre point in a living room, with no sharp edges to catch legs on. Round Grey Mid Century Modern Coffee Table: Recycled leather upholstery covers this table top on solid walnut legs. Small Round Mid Century Style Tray Coffee Table: 30 inch round mid century modern coffee table with a 2-inch deep lip, this resembles a serving tray perched on wooden legs. At only 17 inches tall it’s an ideal modest size to complement a small scale sofa or chair. It could also be paired with an additional table for a flexible arrangement. 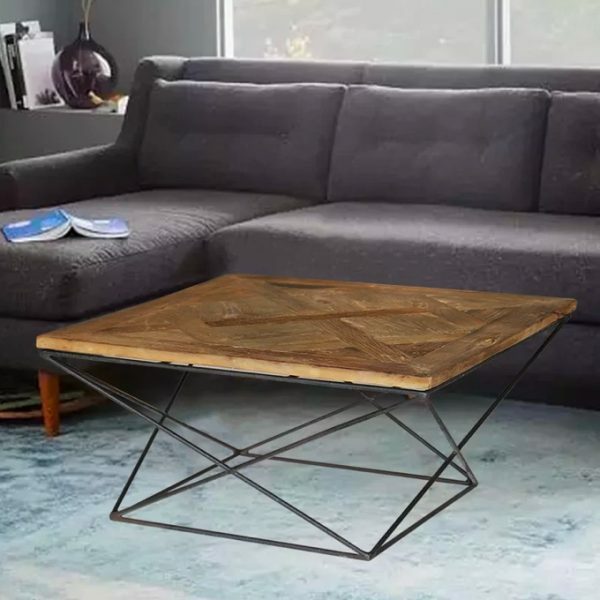 Simple & Minimalist Mid Century Modern Coffee Table: A rectangular mid century modern coffee table crafted from natural rubberwood and reinforced with metal. Metal & Glass Mid Century Modern Table: A gold tone metal frame and smooth glass tabletop gives this design an elegant air. 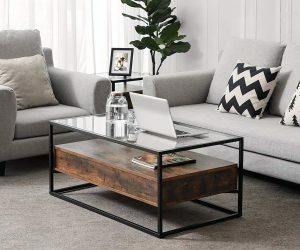 Nesting Mid Century Coffee Tables: Durable solid MDF finished with smooth UV paint, these tables look the part either nestled together or utilised as separate end tables. They are lightweight to make it easy to chop and change between layouts and rooms. If you love these type of tables, do check out our post on: Nesting coffee tables. 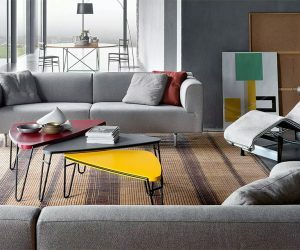 Multi Level Mid Century Style Coffee Table: The Rocket coffee table is a modern take mid century styling, inspired by iconic 1960’s silhouettes. A pecan wood finish featuring a hand painted steel patina. Mid Century Modern Style Coffee Table With Magazine Display Rack: A great one for keen book readers or for those who covet their magazine subscriptions. 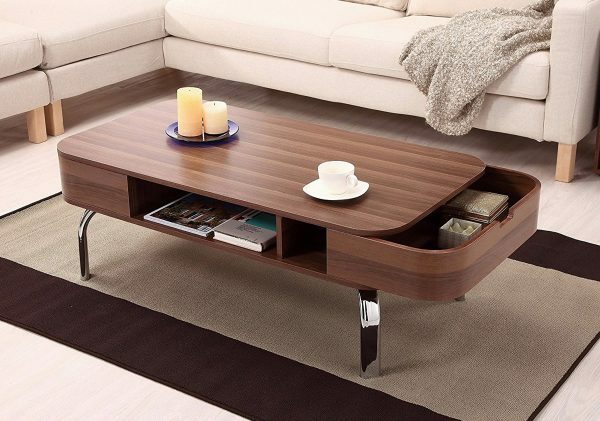 This glass topped coffee table has a display rack built right into its stand. 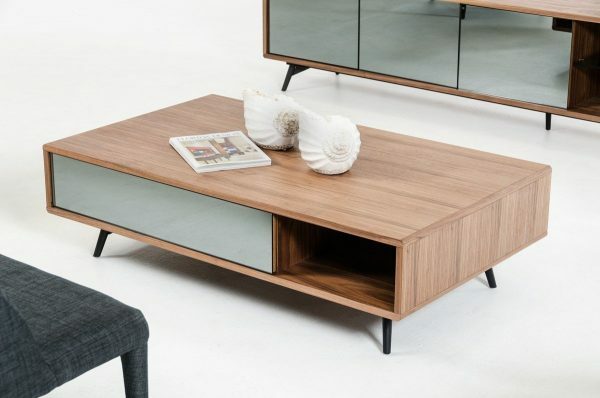 Mid Century Rounded Rectangular Coffee Table: Hidden storage is always a plus point in furniture design, and this table offers a choice of two cleverly disguised side drawers that can also be pulled out completely to double as serving trays for drinks and snacks. 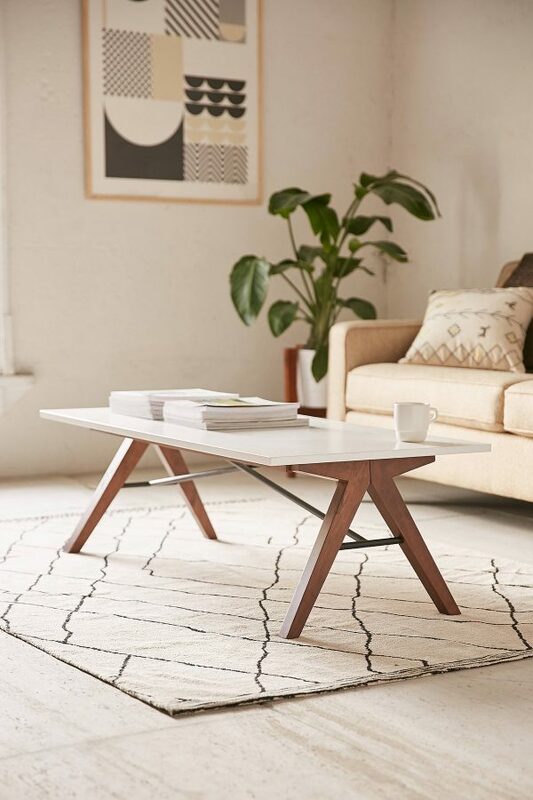 Minimalist Mid Century Modern Coffee Table Made Of Metal, Glass & Wood: This table has the option of hiding away items in drawers or putting them on display beneath the clear glass top. Two Tone Mid Century Modern Coffee Table With Drawers: Made of dark brown acacia wood with a contrasting cream coloured storage drawer. 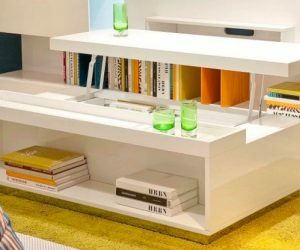 This table is part of a collection that includes a matching end table, sideboard and desk, plus large and small bookcases. Mid Century Modern Walnut Veneer Finished Coffee Table: A low coffee table with a mirrored glass drawer and side cubby. 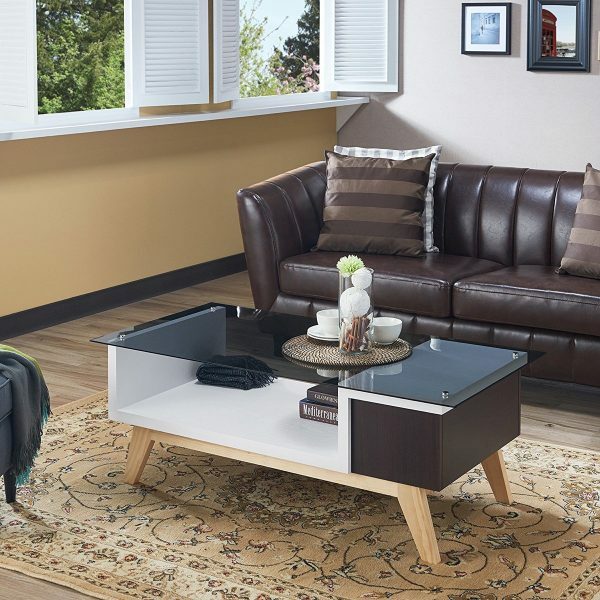 Three-tone Mid Century Modern Coffee Table With Glass Top: Featuring an open shelf beneath a smoked glass tabletop and a drawer that can be finished in espresso, grey or navy colourways. 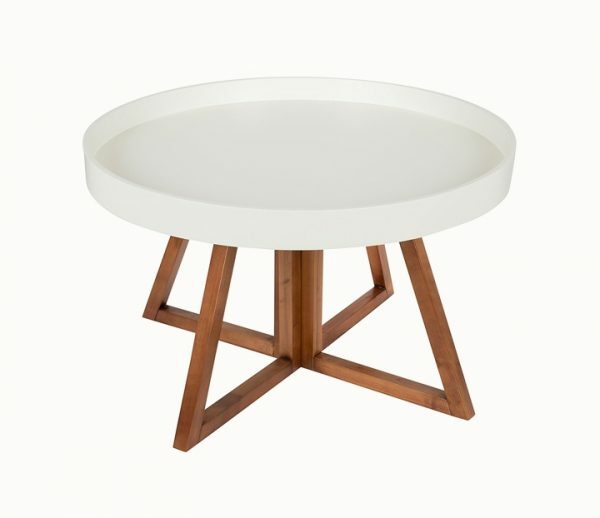 Mid Century Style Coffee Table With Top Tray: Reading like a danish mid century modern coffee table, this matte white and oak veneer finish would work well in a Scandinavian setting. The oak box can be removed for use as a tray and reveals hidden storage beneath. 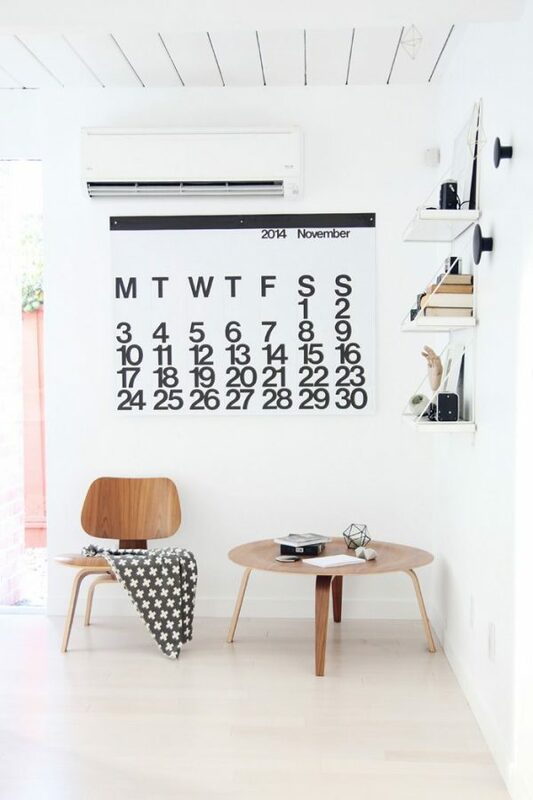 Simple yet somewhat quirky form and function is something that mid century modern and Scandi design have in common, making an interiors mix of them a marriage made in heaven. 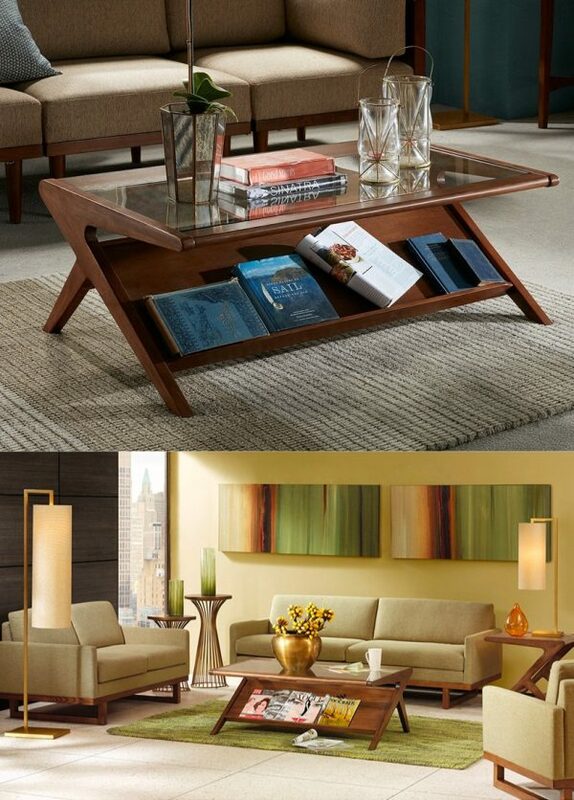 Mid Century Modern Lift Top Coffee Table: From a lift-off tray to a lift-up top. 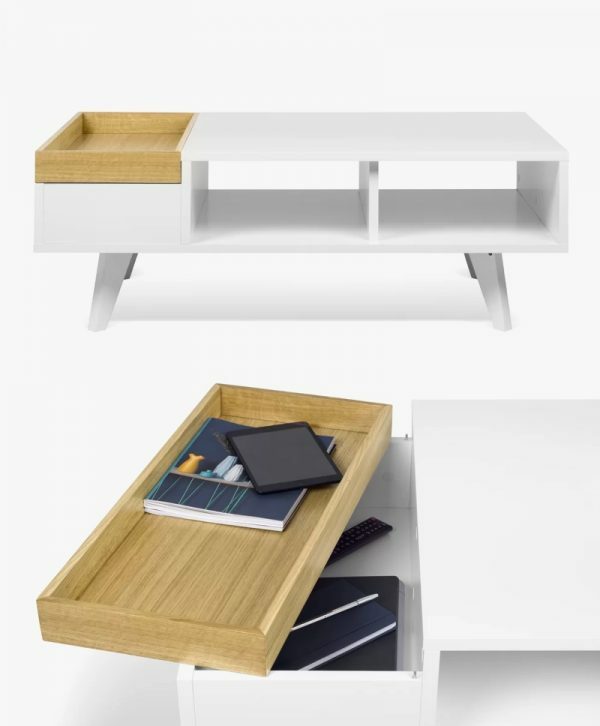 The elevating tabletop transforms a low coffee table up into desk height. Mid Century Modern Oval Lift Top Coffee Table: This lift top coffee table has a contrasting wood and white finish over an elliptical shape. 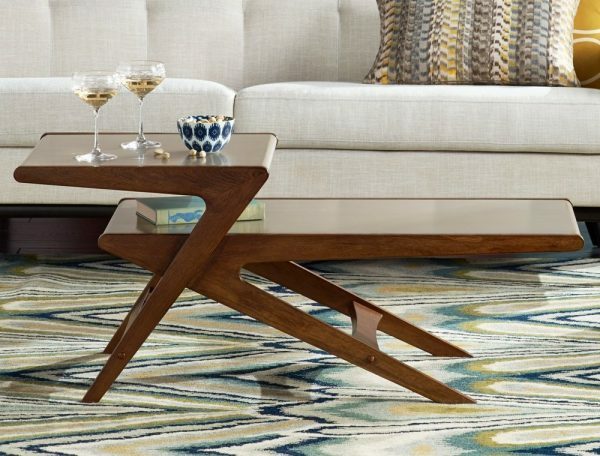 Mid Century Modern Square Coffee Table: Sitting above a black metal base, the surface of this square mid century modern coffee table is made from reclaimed elm wood. 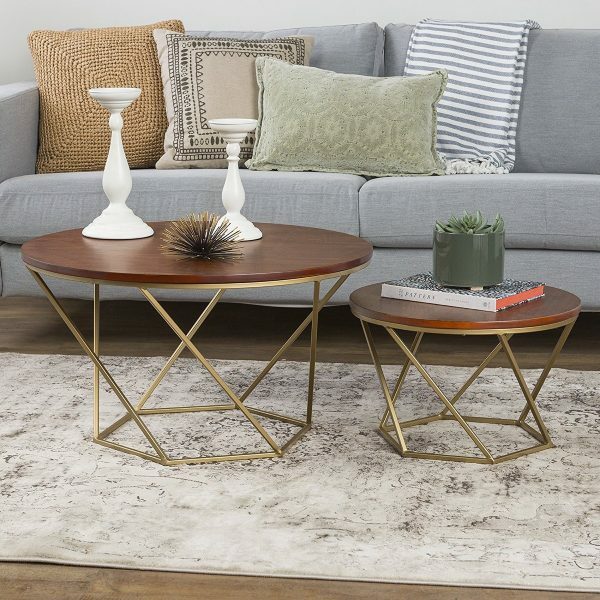 Mid Century Style Coffee Tables With Metallic Accents: The metallic base on this design has a geometric look that would complement many a contemporary interior scheme. 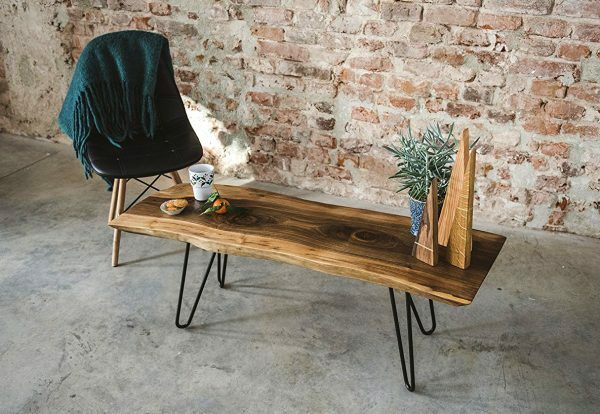 Reclaimed Wood Coffee Table: This live edge mid century modern coffee table is covered with unique characteristics.